This week’s Geek Chic is inspired by the Buffy, the Vampire Slayer marathon I am currently watching while writing this. There happens to be a marathon on focused on the last few episodes of season 3, which you may remember centers around the Mayor’s Ascension planned to happen at graduation. 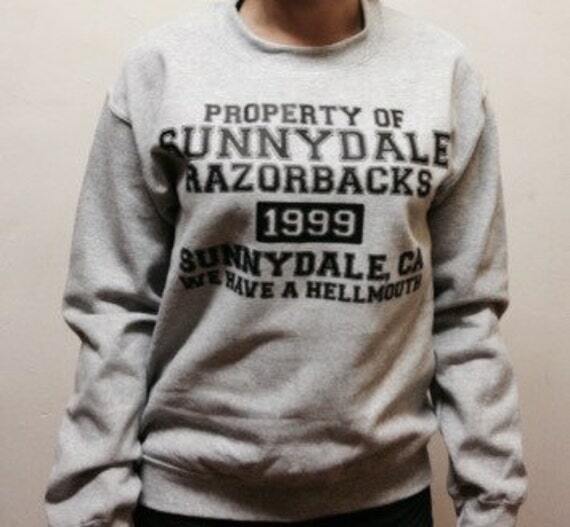 I started feeling pretty nostalgic, so I started an Etsy search to find some gear to rep’ Sunnydale High school spirit! Go Razorbacks! Etsy shop, allaboutrecords, has some great pieces that are Sunnydale High themed. Personally, I love the sweatshirt pictured above. The best part is that it looks legit so the geekiness is pretty sneaky. You have to really read what’s on the shirt and know what it is referencing to get the geekdom. I love private jokes so having a shirt that only select people will understand is right up my alley! What makes this sweatshirt even better is that it comes in a variety of colors, so you can really customize to fit your style. It also costs only $15.00!! That’s an awesome price! The seller has great reviews, which is super important when ordering handmade items. 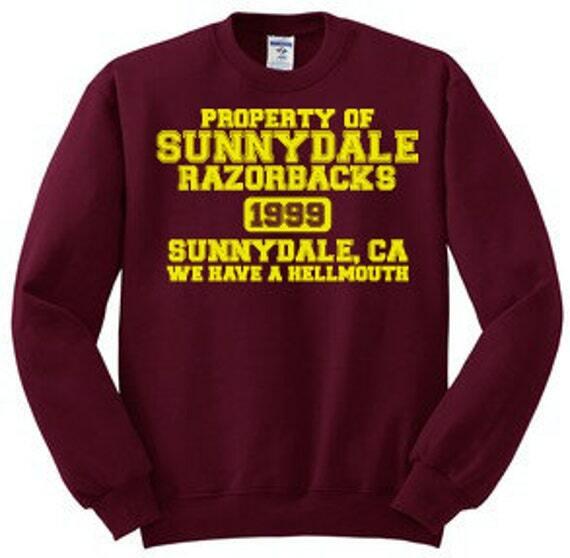 If you’re not into the sweatshirts, they have plenty of other Sunnydale High clothing to fit everyone’s personal tastes! If you are interested in checking out this sweatshirt, click here to find out all the details. And be sure to visit All About Records shop to see even more of the great items they offer! What do you think of this sweatshirt? Would you wear it? Let me know in the comments! This entry was posted in Dani, Geek Chic and tagged Buffy the Vampire Slayer, Dani, Etsy, Geek Chic. Bookmark the permalink. These are so awesome… especially since I also graduated in ’99. Now this is way too cool.